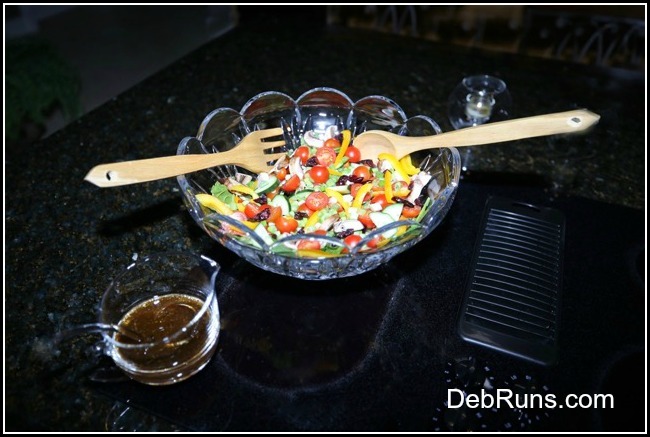 My friends always rave about my colorful tossed salad, so much so, that they’ve dubbed them Debbie Salads. Since my friends seem to enjoy my salads so much, I almost always volunteer to bring one to any dinner party, barbecue, or get together that Bill and I are invited to attend. 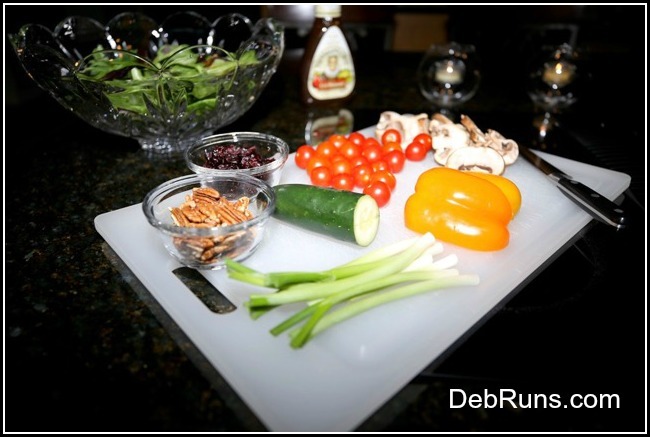 One would think that a Debbie Salad would be quite complicated since it’s in such high demand, but perhaps the simplicity is what makes it so popular. In reality, it’s the same salad I serve at our own dinner table several nights each week. Once all of the veggies are cleaned and chopped, I add them to the top of the bed of greens. Depending on my mood, I either arrange them carefully by color or just tossed them on randomly. If I’m serving the salad alone or with a really light meal, I’ll add cranberries and/or pecans. Just before serving, I drizzle a tiny bit of dressing on the salad (a little goes a long way). For your convenience, I’ve made a recipe card for you to print out and file with your other favorite recipes. Please keep in mind that the calories and macronutrients listed at the bottom of the recipe are for a salad with cranberries and pecans. Enjoy! What ingredients do you put in your salads? How often do you serve salads? I eat salad all the time. And I’m sorry to say one of my favorites is my caesar-waldorf hybrid, so it’s just grapes, romaine, mayo, tuna, and parmesan. I eat it every week! I do eat other salads too. I make my own dressings — almost never buy them! I’ve not had your hybrid salad, but I do have to admit that I love a good Caesar salad. Yum! I’ve been wanting to try Paul Newman’s dressing. Your salad sounds delicious and I can’t wait to try it! Thanks, Susan! I’m sure you can come up with your own version of Newman’s lite balsamic with very little effort.